Bello!​ Watch Minions FOR FREE on GMovies' Potato Night this July 8!​ - Hello! Welcome to my blog! 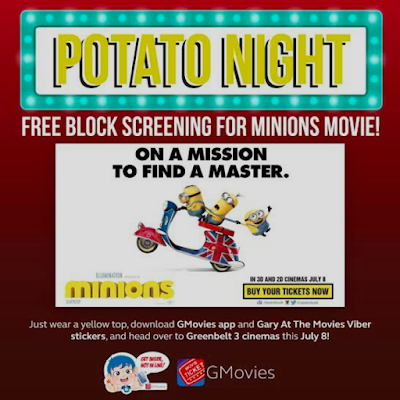 Show up in yellow, present your smartphones with the GMovies app and Gary at the Movies Viber Stickers to be one of the 200 LUCKY PARTICIPANTS of our special screening. Film­tastic prizes will be given away! 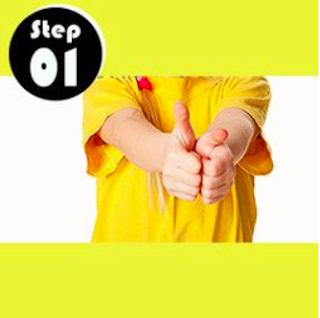 Wear a yellow top. Anything within the shade of yellow is good with us. If you want to go all out and be your own Minion, you might just snag a cool prize from us! Download the GMovies app on the Playstore or Appstore. 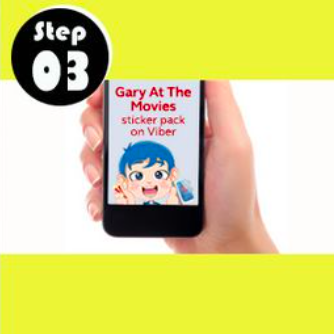 Download the “Gary at the Movies” sticker pack on Viber. So it's a movie date on the 8th? Screening will be at 7:00 PM in Glorietta Cinema 4. Registration starts at 3:00 PM at the GMovies booth located at Glorietta 4’ cinema lobby. Only first 200 people with all three requirements will be given a ticket each! See you there! K​an pai!